Joyce Hornady's bankers thought the idea was far-fetched, to say the least. Bullets? Making bullets for reloaders? What kind of business was that? A person could go broke in a hurry. 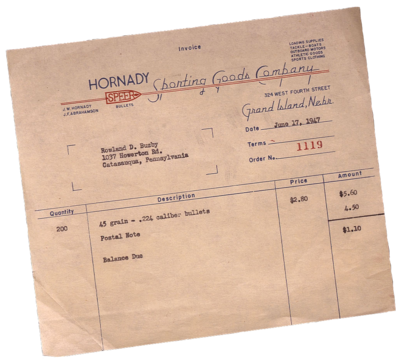 The Hornady Sporting Goods Company was a business they could understand; bicycles, tennis rackets, team uniforms, basketballs, baseball bats and gloves. Now, that was a business. But bullets … no, there was no future there. And so it was that J.W. Hornady learned the entrepreneur's first lesson: "A banker is someone who'll lend you an umbrella only when the sun is shining." In 1949, with World War II over, with the economy returning to peacetime status, with shortages beginning to recede, with Americans anxious to get on with normal lives, Joyce Hornady started a new business. The nation was optimistic. Hornady was especially optimistic. He knew, he absolutely knew, there were thousands of shooters who wanted what he'd wanted: accurate, deadly, dependable bullets they could afford to reload. "Accurate, deadly, dependable" described his products so well that it became the new company’s first advertising slogan. Hornady, the son of a pastor, was named for a prominent Methodist bishop, Bishop Joyce, who oversaw church affairs in Colorado and western Nebraska. The resourcefulness Joyce later put to use in his business was evident from his childhood on. His father died from an abscessed tooth—something modern medicine would cure in a moment—and he learned early on to share responsibilities helping his mother and his siblings make do on a tiny pastor’s widow’s pension. Nevertheless, he learned to shoot, he learned to hunt—and he loved both. In January 1981, traveling with engineer Edward Heers and Customer Service Manager Jim Garber, Joyce Hornady and his companions were killed when the company plane they were flying crashed en route to the SHOT Show in New Orleans. The linchpin of the company was suddenly gone. The company’s founder, visionary, spokesman, leader, and strategist was tragically killed. After the immediate shock and grief abated somewhat, a giant question remained. What was to happen to the company? There were those who doubted it could survive the tremendous loss of its first and only leader. That was not the belief of Marval Hornady. The family needed to regroup, and so it did. Steve Hornady became president and Marval the chairman of the board. Daughter Margaret Hornady David and her husband, Don, left careers at Polaroid to become vice president and chief engineer, respectively. A new era had begun. Executive leadership of the Hornady Manufacturing Company has not faltered in the firm’s first 60 years. What was created in 1949 grew sound enough and strong enough to survive the cruel blow of losing the founder 32 years later. Under Steve Hornady’s leadership, and with the active support and involvement of the Hornady family, the business has doubled, and doubled again, and doubled again. In 2006, Jason Hornady, Steve's son, returned to the company as director of sales and is currently vice president. The stature of Hornady Manufacturing Company within its industry has never been higher. Hornady Manufacturing has gone from a start-up in a small Grand Island former auto body shop to become the largest independently owned maker of bullets, ammunition, and tools in the world. That’s quite an accomplishment. It demonstrates that a great many things have been done right throughout the company’s history. It suggests as well that the future may prove just as promising. The Hornady Manufacturing Company is truly more than the sum of its employees, equipment and facilities. A visitor to Grand Island, Nebraska, can quickly discover how active the Hornady family has been in community affairs, how generous in its philanthropy, how concerned for helping others—including the larger shooting community.